Sometimes all you want to do is to play Internet radio on your computer. Most music players support Internet Radio, some offer in-program browsing and searching of music, others can play what the user selects on a website or loads from the local system. 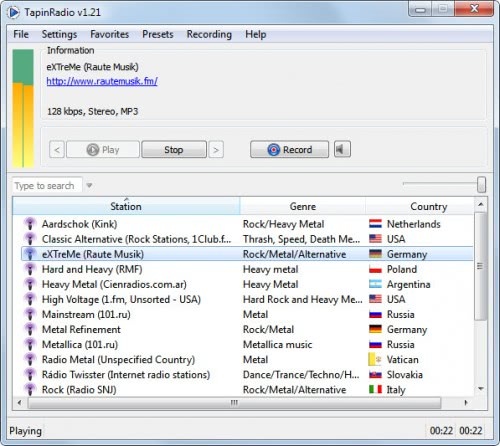 Tapin Radio has been designed to be an easy to use Internet Radio player and recorder. The program is available as a portable version and installer, both of which are offering a wide selection of Internet radio stations for selection. The program will automatically check for updates on startup and download updates that are found immediately without user interaction. A selection menu with built-in search is available in the radio player. Users can either enter a search term, e.g. for a genre or station name that they now, or pick one of the available categories. Either way, a listing of radio stations is displayed in the lower half of the screen. A double-click on a station connects to the stream, and music begins to play in the player. The player offers basic controls. It is possible to change the volume of the music and to stop it. Stations can be added to the favorites to open them faster whenever the program is started. Tapin Radio keeps track of opened stations which offers another option to launch previously played radio stations in the player. The Internet radio player can also load a stream url directly from the file menu. About recording Internet radio. A click on record in the main interface, or the selection of Recording > Start Recording in the menu records music from the radio station that is currently playing in the music player. The options contain recording settings. Tapin Radio for instance records only mp3 streams by default. Wma, aac and ogg streams need to be enabled in the recording options before they can be recorded. It is not really clear why that is done, and the developer should consider enabling the recording all all stream types automatically. Songs are automatically recognized if the radio station adds meta information to the stream. If that is the case songs are saved individually in the format artist - song. Tapin Radio's biggest strength is that it is easy to use. It takes less than ten seconds to find a radio station and start playing it in the player. The ability to record what is playing is a nice bonus. Advanced users may prefer an all in one solution that programs like Winamp, AIMP2 or Windows Media Player offer. It may take a tad longer to find and play a radio station, but the additional functionality makes more than up for it. It would be nice if Tapin Radio would support the recording of multiple streams, and options to play and record different stations. Users who want to test Tapin Radio find more information and downloads at the developer website. It really looks like http://www.screamer-radio.com/ . BTW, in French, “tapin” is casual for prostitution. Thanks so much for the article. btw Tapin-radio in PRO version costs $15 can record one station and listen to the other one allowing more instances to be started (menu/setting/options) and has ability of adding podcasts, sleep mode, scheduling to record a program when you’re not home and the great option in menu/recording to add a group to so-called wishlist e.g. Queen and when a station with meta-data starts playing any song by Queen TR will automatically record it and after the song is over it stops the recording. You can as well connect TR with your LastFM account etc. etc. just beautiful piece of software and it’s worth to support them finantially. TR keeps the database updated every week with tons of new ones and fixed the current ones. Totally different level of custom care policy! Obviously TR re-encodes the Vorbis audio in some weird way. That is why I wouldn’t buy the PRO license.